“Barriers to labor mobility may reduce its effectiveness as a regional adjustment mechanism. Migration of workers from poor, low-productivity areas to rich and highly productive ones is an important channel through which cross-region convergence may be achieved. Factors distorting internal labor flows are potentially relevant determinants of regional disparities in income and productivity. Indeed, the pattern of internal flows for England and Wales shows that highly productive regions tend to have net outflows instead of inflows. This suggests that factors other than labor market conditions (i.e. productivity differentials) are likely significant determinants of internal migration patterns in the UK. 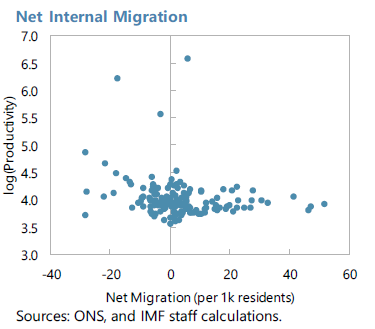 Housing prices (and regulations) have a significant impact on internal migration patterns in the UK. Analysis of bilateral gross flows between regions in England and Wales shows that house prices are negatively related to workers’ movement from one region to another (Box 1). Results are in line with Biswas et al. 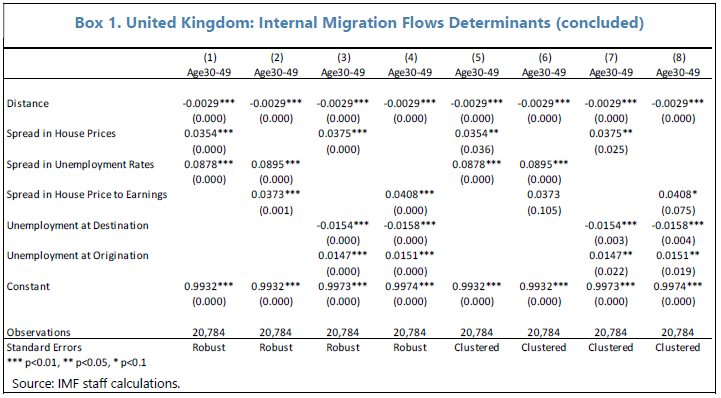 (2009), who study inter-regional migration in England, Wales, Scotland and Northern Ireland, and Rabe and Taylor (2010), who analyze internal migration flows using household-level data for 11 regions in the UK. In turn, Hilber and Vermeulen (2015) show that housing prices are significantly (causally) affected by housing regulations. The impact is economically large: if the South East (the most regulated English region) had the regulatory restrictiveness of the North East, house prices in the South East would have been roughly 25 percent lower in 2008. Evidence also suggests that local housing regulatory constraints have affected income convergence across regions. Data on local housing regulatory restrictions for 46 English counties is used to test whether housing restrictions have affected interregional convergence in the UK. The specification, following Ganong and Shoag (2015), models the change in workers’ real earnings between 1979 and 2008 as a function of its starting level in 1979, a measure of severity of housing restrictions in the same period from Hilber and Vermeulen (2015), and an interaction term of the two variables (Table 1). The coefficient on the starting level of earnings is significant and negative, suggesting income convergence between counties with low initial earnings and counties with a high starting level of earnings. The interaction term of earnings and housing regulations is highly significant and positive, indicating a dampening effect of tighter housing regulations on the speed of convergence across counties. To the extent that earnings are correlated with productivity, housing restrictions have likely contributed to differences in productivity across regions as well.